If there’s one thing I love, it’s a good cocktail party! 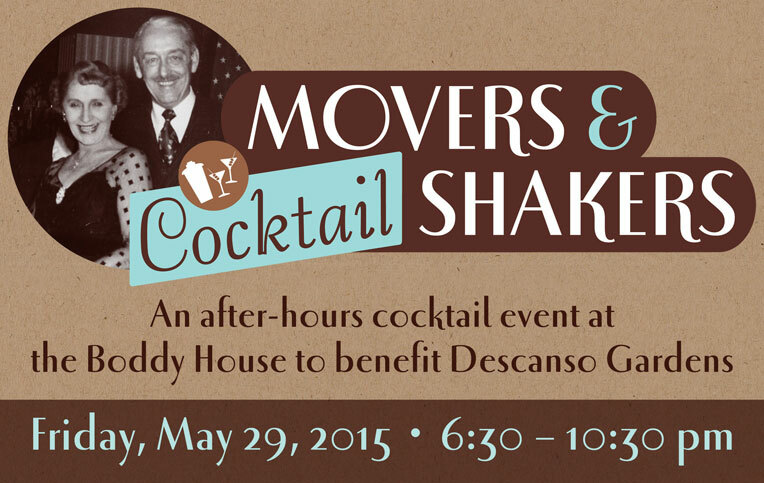 Descanso Gardens has been coming up with some really innovative and intimate events, and their latest, Movers & Cocktail Shakers was the kind that puts the fun back in fundraiser. Held at the historic Boddy House, we celebrated the era of the home through cocktails of the times, headed up by bar director Sean Naughton of LACMA’s Ray’s & Stark Bar. Three handcrafted cocktails told the formative story of the martini and old fashioned through their common ancestor, the martinez, the construction of prohibition-era sours, and the original recipe of the mai thai with hand-pressed almond syrup. Sean told the story of each drink, including interesting info about the ingredients, and gave great mixing advice. After each demo, he taught one volunteer how to make the drink again, so we’d really learn them. To give some real retro flair to this event, we designed a lockup using period typefaces and used photos of the Boddys as a nod to their home. It’s always fun when you get to depart from current branding to develop a themed look for an event, and this one just happens to be an era I love! + See more of our work for Descanso Gardens here. + See more recent work here. there’s nothing like a strong typographic treatment over a simple color palette. this week we’re looking at 3 label series that make bold statements with type and color front and center. it seems like wine wraps are popping up everywhere—whether as packaging for a product, decorative wrap for personal gift-giving, or branded overlays for client gifts, wine is getting wrapped up everywhere! just one component of the rothschild’s wine distribution company, waddeson wine, these wraps manage to show a modern take on the map of the estate, blending historic and contemporary influences. see the whole brand package at designworklife.com. truett-hurst takes a different approach with these buyer-themed wraps, studying reasons and seasons when buyers buy, and designing wraps in the strongest themes. the wraps add an engaging and image-heavy narrative that allows the brand to communicate in a new way with potential shoppers. see more at psfk.com. a very nice collection of wine wrapping papers from design am chiemsee, these wraps are reversible and offer decorative surprises for the recipient. see the collection at underconsideration.com. in case you haven’t heard, i’m hosting a little something called patio season, which is an open invitation to sit & chat, network, or mutually brain-pick during either morning coffee or afternoon happy hour. take me up on it, and all this [snacks above] and more can be yours. ha. recently, someone i’d never met before answered the call and came for a visit! she’s a lovely person, a writer, and a neighbor, ana ottman. we chatted about running our freelance practices, managing clients, how and where we might hire each other if the opportunity comes up, and life in los angeles. i’m so glad she took a chance on coming to meet a new person for a patio chat! turns out, we have a lot of friends in common and have just missed meeting somehow within the same circles, but no more—we just ran into each other at LA creative mornings last week, and she has given me the low-down on where to get earl grey pie downtown. so, conquer your fears, people! there’s no better way to get some in-depth networking done than a one-on-one conversation over snacks & drinks. let’s hang! kickin around pinterest one day, i found these cute conversation-starters pinned to someone else’s packaging board. i love how ali labelle has used the wine as a background color for both rosé and white. see more at ali-labelle.com. another hat tip to hand-drawn type, evoking conversational style, giving voice to the background clamor you might hear at your next party. over wine, of course. see more at the dieline. i love the simplicity and straightforward branding of summit brewing. the logo remains colorful, while it still translates easily to the 3-color packaging, using the natural paper texture really well. see more at the dieline. a very interesting logo and use of pattern & texture by citizen beer. this branding is refreshing, clean and simple, often in 1 color. see more at oh beautiful beer. something i’ve been seeing here & there in wine packaging are bottle wraps. it seems like such a nice opportunity to create interest, but probably doesn’t stand up so well to shipping enough to become a standard. however, during the season of gift giving, you can add something special to your own bottles, or add a layer of your own branding over purchased bottles or homemade concoctions. the 2 samples from the dieline, above, show commercial use by csetvei winery, and a branded gift from brnd wgn. below, pre-sized wraps are for sale for gift-giving from bottlestockshop.com. this kind of student work is what i really think we need more of, especially in beverage packaging. so many liquors try to evoke something sultry and end up looking like cheap dates. this series of infused akvavit associates the flavors with swedish folktales while showcasing a very strong brand. great work! see more at designworklife.com. i think this packaging for pavan is something you either love or you don’t. to me, this color palette is a perfect representation of southern france, and very clearly evokes the flavor of this liqueur, which is described as muscat & orange blossom. this is the kind of bottle i’d keep as a vase after finishing the liqueur. the pavan web site is beautiful, too! see more at thedieline.com.